The Clean Plate Club: A Recipe Post!! 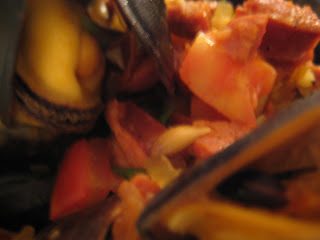 Mussels! This dinner is from a while back now. Shaw's had mussels on sale for $1.99/lb. I bought 1.5 lbs for dinner for the boyfriend and I. I had never purchased mussels before, but I'm really starting to trust this fish guy. He lets me smell things and touch them, and he's usually pretty honest with me about the state of things. 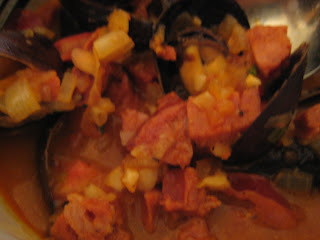 I once read (or watched on some cooking program) that to tell if mussels are fresh, they should smell like the ocean...and if a slightly open mussel is tapped on its shell, it should close up immediately. When you buy mussels they should still be alive, and hopefully slightly active (by mussel standards) to indicate that they are freshly caught or harvested. They should only be stored in the fridge on ice for a day or two. Rinse the mussels thoroughly before cooking in cold water. Clean their little 'beards' off. The fuzzy barnacle like growth. Just pull it out. My batch were relatively clean, so I only had to pull a few beards. And if any are wide open, and don't close when tapped...throw them away! They are dead and no good to eat! 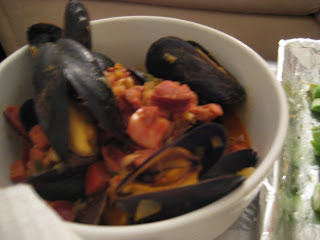 Also, once cooking, if you have any mussels that don't open....throw those away too. Don't get brave. Food poisoning is terrible. When it came time to cook these little fellas, I realized that I had a bunch of things in my fridge that were about to spoil, and I wanted to use them up before they went bad. I had some white wine, a half an onion, half a tomato, some chourica, 1/4 carton of Trader Joe's cream of tomato soup, half a container of chives...and some organic asparagus from that week's delivery. I started with the chourica, which I chopped up and rendered in a hot dutch oven. I let it cook slowly until some bright red oil came out of the sausage, and the meat took on a slightly browned. I then added chopped onion and stirred until it became translucent. Garlic was next into the pan, and it was cooked just a few seconds, until it was fragrant. I then added about a half cup of dry white wine. Once the alcohol was cooked off, I added some chicken broth, and the remaining tomato soup, and seasoned the broth with salt, pepper, thyme and a little cayenne. 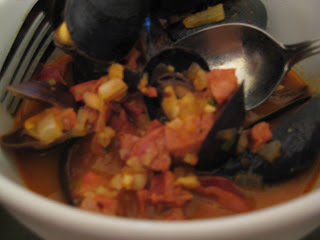 Then I dumped the mussels into the pot, and covered them for about 5 minutes (until they were all open). We served them in a bowl and I topped each bowl with freshly chopped tomato and chives. We at the mussels with some garlic ciabatta bread - for sopping up the delicious broth...and broiled asparagus. The BF was a little worried that the 1.5lbs of mussels wouldn't be enough, but I think they were just right!